The ninth annual Wellfleet OysterFest takes place the weekend after Columbus Day, Saturday and Sunday, October 17 and 18, 2009, in Wellfleet, Cape Cod, Mass. 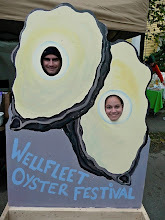 This two-day street party celebrates the town's famous oysters, clams and shellfishing traditions and brings together locals and visitors alike for a weekend full of hometown flavor and big time fun. The town center becomes a walking district that offers something for everyone: local cuisine, arts and crafts, children's activities, educational exhibits, live music and the Oyster Shuck-Off competition. Satellite events away from the crowds, and many with the beautiful harbor as a backdrop, showcase all that our village has to offer: beachcombing and bird walks, a 5K road race and children's fun run, cooking demonstrations, tasting seminars, book talks, and oyster grant tours. Families have a FREE children’s area to explore with a moonbounce, pumpkin decorating, face painting, oyster jewelry making, a steel drum workshop, sing-a-longs and more. Over 90 regional artisans will sell their crafts. Live music on the Main Stage will feature many local and regional bands. Oysters—Marine mollusks having a rough irregular shell found on the sea bed, mostly in coastal water. The coastal waters of Brunswick County produce an abundance of oysters. Each year, over 45,000 people, including locals and visitors, attend the North Carolina Oyster Festival to pay homage to the mighty mollusk. 2009 will mark the 29th anniversary of the festival, which will be hosted by the Brunswick County Chamber of Commerce on October 17-18, 2009. Tickets $35 per person, proceeds support Lynnhaven River NOW.